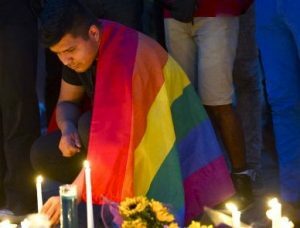 What can we sing to celebrate Pride Month after the deadliest mass shooting in U.S. history? In sanctuaries across America, the walls are draped with rainbow banners proclaiming “GOD ♡’s US ALL,” “BLACK LIVES MATTER,” and “PEACE TO ALL WHO ENTER HERE.” Celebrating diversity, we stand to sing, “CHRIST HAS BROKEN DOWN THE WALL,” certain that God weeps at our barriers, closed doors, guns, yellow stars, pink triangles, barbed wire, and at faux prayers for unity. We march down our streets, rainbow flags unfurled, and party later, dancing in the clubs. Sweethearts of all persuasions hold hands and make vows promising “forever,” or take their kids to the beach for the first swim of the summer — barely thinking twice about being a family with two moms or two dads. Concerts and poetry readings celebrate the creativity in the LGBTQ community. At one book group meeting, mature hands hold tattered copies of Patience & Sarah. The readers remember when it first appeared in 1971 (“And now it’s an opera!” one whispers to another. “It’s being performed in the Village this month. Want to go?”). Some of us thought it possible during Pride Month to take a break from the struggle, thought it safe to look away from the crowds cheering pouty-lipped politicians promising a wall (a BIG wall) to keep out or keep in; the lawmakers legislating what we can and can’t do with our bodies, who we can or can’t marry, where we can or can’t pee; the churches in an uproar over LGBTQ members called to ordained ministry. We thought it safe to take a brief break and celebrate with friends, family, lovers, allies. But then, right in middle of the month and a week before the one-year anniversary of the Charleston church massacre, a man with two guns, one a military-style assault rifle, the other a semi-automatic pistol, entered Pulse — a place of acceptance and fun, welcoming and safe, often the first stop for young people coming out in Orlando — and mowed down 49 joy-filled bodies. The blood’s been mopped up from the dance floor that pulsed to a Latin beat that night, but we can’t seem to wake up from the nightmare of American gun-obsession or our penchant for prejudice. On TV, fundamentalist Christian extremists curse and condemn fundamentalist Muslim extremists or thank them for ridding the world of “perverts,” distortions of scripture dripping from their lips. 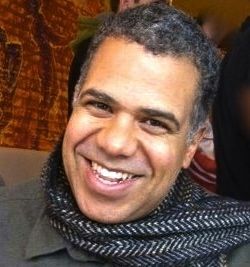 Progressive Christians stare, bewildered, as if we hold different Bibles in our hands, as if we can’t believe that Jesus’ message of love could get so twisted to hate, as if our years spent building bridges, tearing down walls, preaching acceptance and joy in diversity could be washed away so easily. We vow not to stay silent or paralyzed this time. Across the nation, we rise up singing, the memory of martyrs pulsing through our veins. In our churches, we turn again to the works of Mark A. Miller, building our harmonies in a slow tempo for courage and strength, our voices growing stronger with each verse — “Christ has broken down the wall.” We sing of being accepted, of casting aside doubt and fear, embracing love, tearing down every wall. Mark and his partner have two adopted children. In his personal and his professional life, Miller is passionate about using music to draw our circle wide and break down the walls that divide. 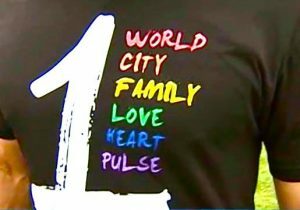 “Orlando’s Pulse Nightclub Was Founded by a Woman Whose Brother Died from AIDS: The Name Refers to His Heartbeat” by James West, Mother Jones, June 12, 2016. 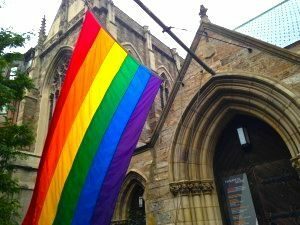 “Queer religious art resource list: Buddhism, Hinduism, Islam, Judaism, Paganism” on JesusInLove blog.